The Ministry has announced selection of 17 new Mega Food Parks against the vacancies caused due to withdrawal or cancellation of the projects selected earlier. Out of these 17 (Seventeen) new Mega Food Parks, 7 (Seven) projects have been approved for State Government Agencies from 6 (Six) States and 10 (Ten) projects have been approved for private promoters. The financial assistance for setting up Mega Food Parks is provided @ 50% of eligible project cost in general areas and @ 75% of eligible project cost in NE Region and difficult areas (Hilly States and ITDP areas) subject to maximum of Rs. 50 crore per project. The total estimated proposed project cost of these 17 projects is Rs. 2333 crore out of which the Government grant is likely to be around Rs. 850 crore and promoters’ contribution as equity and loan is around Rs. 1483 crore. 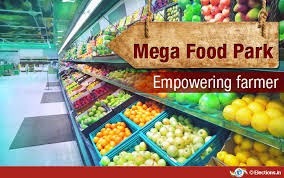 Mega Food Parks aim at creating modern infrastructure for development of food processing sector which helps in reduction in wastage of perishables, value addition to the agricultural produce, providing better price to farmers and creation of employment opportunities especially in rural areas. Mega Food Parks function on a cluster based approach based on a hub and spokes model. Infrastructure is created for primary processing and storage near the farm in the form of Primary Processing Centres (PPCs) and Collection Centres (CCs) located in production areas. These PPCs and CCs act as aggregation and storage points to feed raw material to the processing units located in the Central Processing Centre (CPC). Common facilities and enabling infrastructure like modern warehousing, cold storage, IQF, sorting, grading, packaging, pulping, ripening chambers and tetra packaging units, roads, electricity, water, ETP facilities etc. are created at CPC for food processing units to be set up in the Park. The Government has sanctioned setting up of 42 (Forty Two) Mega Food Parks for creation of modern infrastructure for food processing industries in the country. Out of these, 21 (Twenty One) Parks have been accorded Final Approval by the Ministry and are at various stages of implementation. Four Mega Food Parks at Haridwar (Uttarkhand), Chittoor (Andhra Pradesh), Fazilka (Punjab) and Tumkur (Karnataka) have become operational. The other projects, which have been accorded In-principle approval, are in the process of meeting the conditions of final approval as per the scheme guidelines. This information was given by the Minister of State for Food Processing Industries, Sadhvi Niranjan Jyoti in a written reply to a question in Lok Sabha here today. · The General Provident Fund (Central Services). · The Contributory Provident Fund (India). · The All India Service Provident Fund. · The State Railway Provident Fund. · The General Provident Fund (Defence Services). · The Indian Ordnance Provident Fund. · The Indian Ordnance Factories Workmen’s Provident Fund. · The Indian Naval Dockyard Workmen’s Provident Fund. · The Defence Services Officers Provident Fund. · The Armed Forces Personnel Provident Fund. The rate of interest is applicable to the above funds w.e.f. 1st April, 2015 and until further orders. Recently, the Government had kept the interest rates for PPF and other Small Savings Schemes intact. However, interest rates for 5 year Senior citizen Saving Scheme and Sukanya Samriddhi Account Scheme have been increased from 9.2 to 9.3% and 9.1 to 9.2% respectively, keeping in view the commitment of the Government towards the welfare of the girl child and the senior citizens. Government of India have announced the Sale (issue/re-issue) of (i) “new security maturing on December 15, 2023” for a notified amount of Rs. 3,000 crore (nominal) through yield based auction, (ii) “8.15 per cent Government Stock 2026” for a notified amount of Rs. 7,000 crore (nominal) through price based auction, (iii) “8.24 per cent Government Stock 2033” for a notified amount of Rs. 3,000 crore (nominal) through price based auction, and (iv) “8.17 per cent Government Stock 2044” for a notified amount of Rs. 3,000 crore (nominal) through price based auction. The auctions will be conducted using multiple price method. The auctions will be conducted by the Reserve Bank of India, Mumbai Office, Fort, Mumbai on April 24, 2015 (Friday). Both competitive and non-competitive bids for the auction should be submitted in electronic format on the Reserve Bank of India Core Banking Solution (E-Kuber) system on April 24, 2015. The non-competitive bids should be submitted between 10.30 a.m. and 11.30 a.m. and the competitive bids should be submitted between 10.30 a.m. and 12.00 noon. The result of the auctions will be announced on April 24, 2015 and payment by successful bidders will be on April 27, 2015 (Monday). Policy/Instructions of the Government of India on the reservation for physically challenged persons and recruitment of women are applicable for Public Sector Undertakings also. However, no separate scheme/policy for Public Sector Enterprises has been formulated. In Public Sector Undertakings under Department of Heavy Industry, 77 physically challenged persons and 243 women were recruited during the last three years and the current year, against the target as per the policy of Government of India on the reservation for physically challenged persons and recruitment of women. Government has received the report of the consultant M/s. Institute of Public Enterprise (IPE), Hyderabad. The major recommendation, inter-aila, of the report is merging of the IL unit (Palakkad) with any other major public Sector. The report has noted that as noticed from the minutes of the BIFR or MDRS programme, the company has already explored the possibilities of merger and disinvestment of 51% of Instrumentation Control Valves Ltd. (ICVL) at Palakkad, Kerala. But, this could not be materialized. Hence, at this juncture, the company may explore any other possibility of merging of Instrumentation Ltd. with any other healthy company at a right proposition. At present, the Government does not propose to merge the IL Palakkad with BHEL. The Water Storage available in 91 important reservoirs of the country as on April 16, 2015 was 50.92 BCM which is 32% of total storage capacity of these reservoirs. This storage is 87% of the storage of corresponding period of last year and 113% of storage of average of last ten years. The present storage position during current year is less than the storage position of last year but is better than the storage of average of last ten years. Central Water Commission monitors live storage status of 85 important reservoirs of the country on weekly basis. These reservoirs include 37 reservoirs having hydropower benefit with installed capacity of more than 60 MW. The total storage capacity of these reservoirs is 157.799 BCM which is about 62% of the storage capacity of 253.388 BCM which is estimated to have been created in the country. The northern region includes States of Himachal Pradesh, Punjab and Rajasthan. There are 6 reservoirs in this region having total storage capacity of 18.01 BCM. The total storage available in these reservoirs is 6.49 BCM which is 36% of total storage capacity of these reservoirs. The storage during corresponding period of last year was 37% and average storage of last ten years during corresponding period was 30% of storage capacity of these reservoirs. Thus, storage during current year is less than the corresponding period of last year but is better than the average storage of last ten years during the corresponding period. The Eastern region includes States of Jharkhand, Odisha, West Bengal and Tripura. There are 15 reservoirs in this region having total storage capacity of 18.83 BCM. The total storage available in these reservoirs is 8.49 BCM which is 45% of total storage capacity of these reservoirs. The storage during corresponding period of last year was 55% and average storage of last ten years during corresponding period was 33% of storage capacity of these reservoirs. Thus, storage during current year is less than the corresponding period of last year but is better than the average storage of last ten years during the corresponding period. The Western region includes States of Gujarat and Maharashtra. There are 27 reservoirs in this region having total storage capacity of 27.07 BCM. The total storage available in these reservoirs is 9.71 BCM which is 36% of total storage capacity of these reservoirs. The storage during corresponding period of last year was 46% and average storage of last ten years during corresponding period was 40% of storage capacity of these reservoirs. Thus, storage during current year is less than the storage of last year and also less than the average storage of last ten years. The Central region includes States of Uttar Pradesh, Uttarakhand, Madhya Pradesh and Chhattisgarh. There are 12 reservoirs in this region having total storage capacity of 42.30BCM. The total storage available in these reservoirs is 16.59 BCM which is 39% of total storage capacity of these reservoirs. The storage during corresponding period of last year was 46% and average storage of last ten years during corresponding period was 24% of storage capacity of these reservoirs. Thus, storage during current year is less than the storage of last year but better than the average storage of last ten years. The Southern region includes States of Andhra Pradesh, Telangana, AP&TG (2 combined project in both states) Karnataka, Kerala and Tamil Nadu. There are 31 reservoirs in this region having total storage capacity of 51.59 BCM. The total storage available in these reservoirs is 9.52 BCM which is 18% of total storage capacity of these reservoirs. The storage during corresponding period of last year was 19% and average storage of last ten years during corresponding period was 24% of storage capacity of these reservoirs. Thus, storage during current year is less than the corresponding period of last year and also less than the average storage of last ten years during the corresponding period. States having better storage than last year for corresponding period are Himachal Pradesh, Punjab, Karnataka, Kerala and Tamil Nadu. States having equal storage than last year for corresponding period is Tripura. States having lesser storage than last year for corresponding period are Rajasthan, Jharkhand, Odisha, West Bengal, , Gujarat, Maharashtra, Uttar Pradesh, Uttarakhand, Madhya Pradesh, Chhattisgarh, Andhra Pradesh, Telangana, AP&TG(2combined project in both states).